Among the dead were a pregnant woman, two siblings, an old woman and a man returning from his place of work,Punch reports. Several others were also said to have sustained varying degrees of injuries, including fractures and broken limbs in the Saturday incident which happened around 9pm. It was learnt the driver of the yet-to-be-identified woman had left the vehicle for her near Majok Filling Station on Ilaje Road and had left for his house. The woman, said to be staying on Adebisi Street, had barely taken the wheels to drive the SUV home when the incident occurred. The vehicle reportedly surged forward, crushing pedestrians and killing four of them on the spot. A set of nine injured people were reportedly taken to the Gbagada General Hospital, among whom two died; while another set of seven casualties were later recovered. It was learnt that two more corpses were found in the gutter on Sunday morning.Angry youths were said to have gone to the scene and dragged the woman out of the SUV and beaten her up. She was about to be lynched when some policemen from the Bariga Police Division intervened. PUNCH Metro learnt that the suspect was to celebrate her birthday on Sunday and was going home to make preparations for the event before the incident. When our correspondents visited the area on Monday, about 20 okada riders (motorcyclists) besieged the police station to demand the corpses of two of the people who were killed in the accident. A resident, identified as Iya Oyinbo, said the vehicle seemed to have had a brake failure. “The woman was driven to the Majok Filling Station by her driver after which the man left for his house and the woman moved to the driver’s seat to drive the vehicle home. What we saw was that the SUV suddenly surged forward and hit a pedestrian at the filling station. “The vehicle also moved from there to hit some pedestrians by the roadside. It was three stationary faulty cars at the end of the Ilaje Road which eventually stopped the SUV. Another witness, Raheem Banji, said the corpses of two motorcyclists were found the following morning in the gutter where the SUV had flung them. A Keke Marwa driver, Laide Olakune, said he was lucky to have escaped, adding that his tricycle was badly damaged by the vehicle. Olakunle said he was taking four passengers to the Ebute area, when the tricycle was hit and they all fell into the gutter. 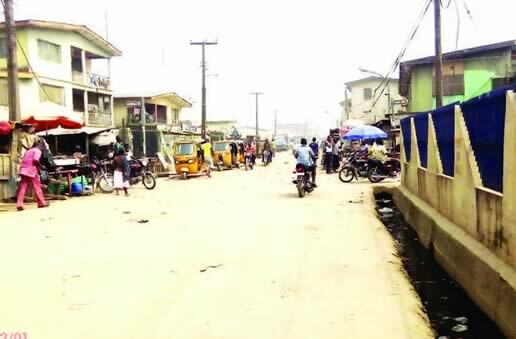 “Although my tricycle was damaged, neither me nor any of my passengers sustained injuries. The police wanted to take away my tricycle as part of evidence, but I refused because I need to repair it and put it back on the road so I can make a living,” he said. A police source said the female driver, who was rescued with injuries, was recuperating in a private hospital in the area. “The woman is wealthy, and she was to celebrate her birthday on Sunday. The mob stripped her to the underwear and beat her up. She is recuperating in a hospital; her husband has showed up at the police station. The spokesperson for the Lagos State Traffic Management Authority, Mahmud Hassan, said he was not aware of the incident. The Police Public Relations Officer, SP Dolapo Badmos, confirmed the incident, adding that the matter was under investigation.